If it were ever possible for a rock band to supersede nearly 30 years of infectious melodies and rock anthems with one single album release, Cheap Trick would be the masterful culprits. Their June 2006 release Rockford combines some of their most contagious riffs and vocal hooks with a matured complexity that comes from nearly three decades of writing and touring the world together. The ultimate result is 12 thoughtfully crafted pop rock gems that could very well blow this year’s leading young rock band right off the radio and stage. Doors are opened to ya / That’s all we can do yeah / Before then I knew ya / Rules are changing ooh yeah. “O Claire” sweetens the album midway through a series of hard-hitting and melodic anthems while “One More” weaves a bit of playful soul into the mix. Co-written and co-produced by Linda Perry (4 Non Blondes), “Perfect Stranger” is a bit less hooky than the other tracks, but still proves worthy enough to release as the album’s first single. The CD packaging itself screams loudly with color and is adorned with cartoon caricatures of each member. Perhaps with the amount of respect and adoration this band has collected over the years, an artsy or thoughtful album art approach would be unnecessary at this point. It seems that Cheap Trick wants to let everyone know the most important thing about playing rock music is to have fun and to not take yourself too seriously. Also, the CD booklet is supplied with just album and song credits; printed song lyrics seem to be a dispensable commodity alongside such hooky and memorable tunes; they are easy to sing along with even after the first few listens. Rockford serves to remind the skeptical music fan that it is possible to produce an extremely rocking yet melodic record in this day and age without the angst and gripe that plague today’s younger rock bands. 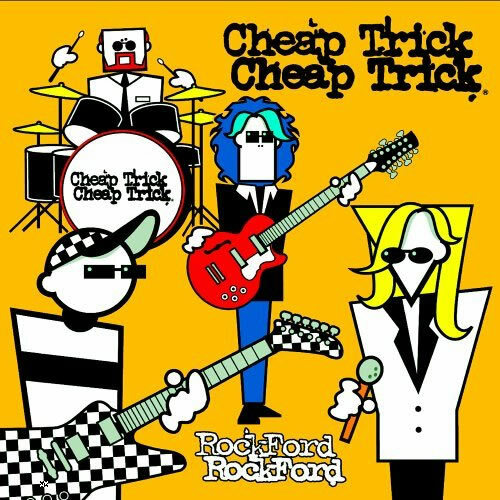 Cheap Trick’s precision and energy are not capsulated within the tweaking abilities of studio production, but in their perfected songwriting abilities and matured inventiveness. After decades of releasing albums and performing, Rockford announces to the music world that Robin Zander remains one of the most unique and commanding voices in rock-n-roll while Rick Nielsen, Bun E. Carlos and Tom Petersson continue to enchant and impress fans new and old.